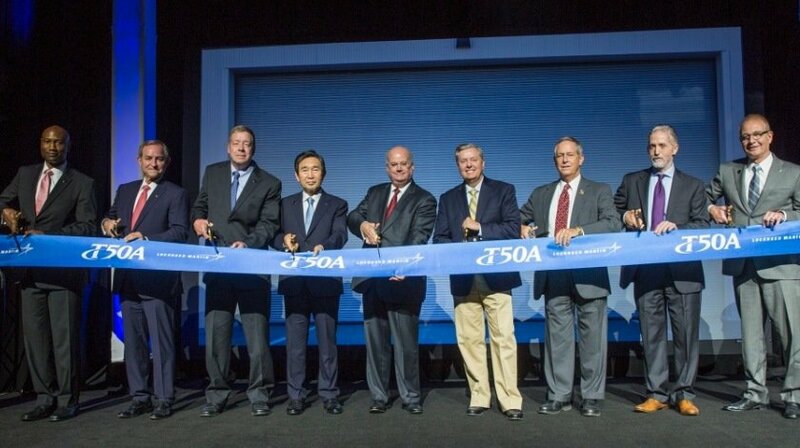 Lockheed Martin officially opened its Advanced Pilot Training facility in Greenville, South Carolina with a celebration and traditional ribbon cutting event. The newly refurbished building will house the Ground Based Training System, as well as the tooling and manufacturing equipment to complete final assembly and flight operations for the T-50A trainer aircraft. “I want all of the enemies of America to understand that we are not looking for a fair fight. My goal is to have the overwhelming capability to deter those that would choose to go to war with us…they will lose and lose quickly. The T-50A is ready now and fits the need of the 21st century of the U.S. Air Force,” said U.S. Senator Lindsey Graham. The T-50A is low risk and builds upon the proven heritage of the T-50 with more than 150 T-50s flying today – 200,000 flight hours and counting – and more than 1,800 pilots who have trained in this aircraft. “From the innovation of our Skunk Works team in Palmdale, California – who brought this program to life – to the employees in Greenville who will build the T-50A, the brightest minds and the latest technology have been brought together in this facility to provide the U.S. Air Force with a low risk, highly capable aircraft and training solution,” said Lockheed Martin Aeronautics Executive Vice President Orlando Carvalho. Lockheed Martin completed the initial flight test of its first T-50A configured aircraft on June 2, 2016 and the initial flight of its second T-50A configured aircraft on July 26.